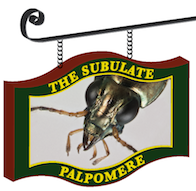 Welcome to The Subulate Palpomere, a blog about beetles, beetle diversity and evolution, and the Tree of Life. It is written or edited by David Maddison. It includes posts about my efforts and my lab’s efforts to discover and document biodiversity, including new species of beetles from around the world. On occasion it also covers other things that relate to this: cool beetles, how-to guides to studying beetles, programming and software for studying evolutionary trees, scientific illustration, field work, and the life of an academic. As to why it is called The Subulate Palpomere: there is a particularly cool group of beetles, the genus Bembidion and its relatives, that have subulate palpomeres, and I have loved these beetles for almost 40 years. Beetles have appendages around their mouth called “palps” that are like little feelers – the beetles use palps to handle their food, and to taste their food. A palp is made of several pieces, and each piece is called a “palpomere”. 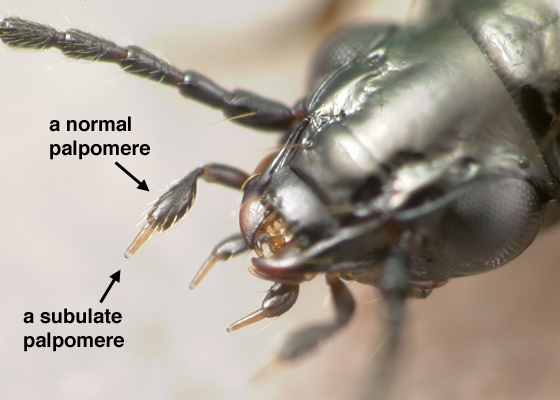 Bembidion and its relatives are unusual in that the palpomere at the end of the palps (the last palpomere) is thin and tapered – and the word used in entomology to describe such a thin and tapered palpomere is “subulate” (see picture, below). I just found your blog and have to say that I’m quite enjoying it. Your post on drawing beetles is very interesting. If inspiration strikes, would you be willing to write a post on identifying beetles? I’ve got American Beetles Vol. 1 and 2, but don’t get much use out of them because I tend to get lost in the lingo! I’d be happy to write a post about identifying beetles – but how you do it depends upon the group of beetles. I could easily write one for Bembidion, for example, but that would be a very different post than writing one for all of beetles. Where do you tend to get lost? Carabids and cerambycids are the tough ones for me. Awesome blog ! The beauty of patterns on some of those beetles is very inspiring. I was wondering while looking at pictures of some elytron what function the patterns have. Do the bumps, ridges, and striations have a structural function that helps stiffen the elytra? Some of them features are thought to stiffen the elytra. Some aspects (e.g., the microsculpture) have functions that to some extent can likely be understood (e.g., the rougher microsculpture of females may allow the males to hold on more readily), but surely there are functions we don’t yet understand.